Last week has been all about the Mozzy. 90% of systems are complete and gotta say its been so much fun flying around. Definitely my favourite addition to the game since the introduction of Vehicles. I had originally seen the Mozzy as a super rare vehicle that only baller clans would get to, but I’m now leaning towards making it fairly fragile and easy to lose and not too hard build. We’ve been looking for gameplay mechanics to bring into the heavy slot system we tested a few months ago, and refuelling Mozzys will be the first. Avgas that runs the Mozzy will be refinable from other materials only at some of the territory control points around the map. Transportation of this fuel will only be able to be done by heavy slot. A player can only hold 1 heavy slot item at a time, and can only walk at a slow pace while holding it. The fuel can be loaded directly into the Mozzy or can be alternatively shipped to your hangar using… “The Slug”! The Slug has been waiting in the wings for a while which we plan on releasing with the Mozzy very soon. For those who don’t know, the slug is a heavy truck designed for transportation of speciality items that can’t be carried by players or other vehicles. It will be vulnerable to highjack but successful convoys across the map will yield big benefits. The slug struggles off road so camping out the road network with fast vehicles waiting for convoys will hopefully be a profitable exercise. We haven’t yet locked down what will be going out next patch, it will be sometime early December. Stay tuned. I’ve been in a bit of an Icon Fiesta this last week. We had some issues with the system being a bit broken but figured out what was up with it. I’m going to spend the next couple of days making sure they all look much better than they have in the past. We have an automated system that will put the object in front of the camera and record that camera position and that will create an Icon Pose which will show the object. This doesn’t yield optimum results so it’s good to go through it every now and then and give each item a nice angle and some good lighting to make the items pop. I did also fix up some things on the Mozzy (Helicopter) so that it would look even better in-game. We flew the Mozzy on Friday and I can say it’s hard but fun as hell! This week I returned from holidays and got stuck back into the vehicle system. We’ve been reviewing your feedback and agree that we’ve missed the mark and ended up with a system that isn’t as fun as legacy. With this in mind we’re rolling several changes back in the hope of returning to a place where stealing vehicles is more impactful and farming up vehicles from world chassis spawns is more achievable. As well as these changes we’re also going to shake up the spawns a bit and get those back closer to legacy as well. Currently the vehicle chassis are spawning at semi-random points around the road network but we’ll be changing it so they spawn in and around certain towns. Along with this change we will also be bringing back town loot outside of event times, our current plan is to try and have three different ‘flavors’ of loot: Vehicle, Military and Construction with the different types coming from different towns. I’ll be working on setting this all up this week. This week I fixed an extremely annoying problem with the new characters, the way I had gone about doing the head and neck had caused a pretty bad seam. This was something I tried to prevent during the process but I guess what ever I did didn’t really work and the seam just slipped through the cracks. I ended up having to merge up the neck and head instead of having them as separate models and rebake just those two pieces together then splice the fixed seam into the old normal texture. It worked but it was annoying. I then had to do the same thing with the female hands due to the same problem but after just running through that problem it was pretty easy. I’ve also been fixing the shoreline because it’s been horrible for a very long time now. This was also a bit of an annoying problem, I could have hacked something together that lasted a while but that can be a very dangerous way of working so I actually took some time to test out different approaches and found one that worked the best, it now looks much better and isn’t a destructive process that get’s reset every time I need to make a change in the final map. Exciting times around the office this week seeing the team’s hard work come to fruition. Experimenting with the mozzie and how I will capture footage of it for the trailer is a lot of fun, I cant wait to blast “Ride of the Valkyries” and fly over the palm trees of the beach. Today we get to put V2 to the test as we are all set up to capture for the trailer. Its gonna be a blast and a lot of footage to log after. Last week was full steam implementing the territory control system and getting the patch out the door. I’m pretty happy with how it came together and checks another thing off the list of todo before V2 release. This week I’ve moved onto implementing our first aerial vehicle, the Mozzy (Helicopter). I’m a massive fan of the old Battlefield series choppers (like BFV) in that they were tricky to fly, and in the wrong hands would mean a dead squad. I can’t stand the modern take on choppers that you can’t crash even if you try, so I’ll definitely be making this one a challenge. 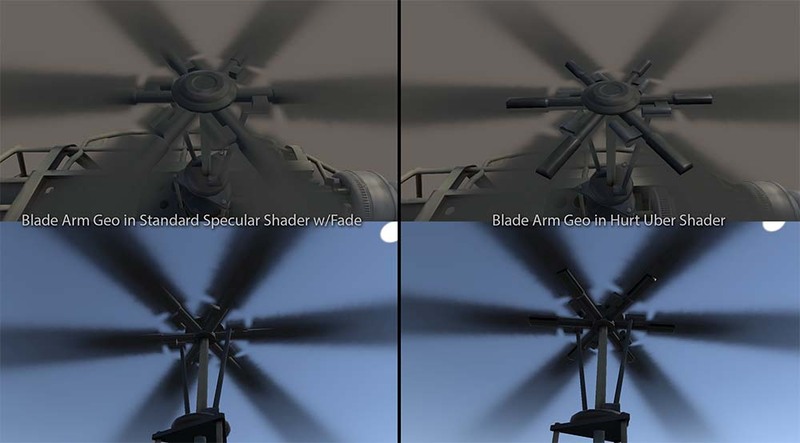 Helicopters work fairly similarly to other vehicles in our systems, just a drivers seat, rigidbody and some forces based on input. The biggest challenge is we currently have no mechanism of locking and capture mouse movement on the server for vehicles. To do this we need to clamp the mouse to the center of the screen for specific vehicle seats, then pack our mouse deltas into the direction vector that is usually sent assuming the server knows what to do with it, then not render the client side mouse movements. We are using the mouse to control pitch and roll, A&D as yaw as in most games. I have a rough prototype working well now, but my OBS is recording at 15fps since reformat so you’ll have to wait until next week to check it out. Next on the menu is designing the sounds for it, dust particle effects when near ground, and blade animations. I hope to have all this completed this week. I’ve been a busy beaver this last week. First up I created the Clan Totem do-over. 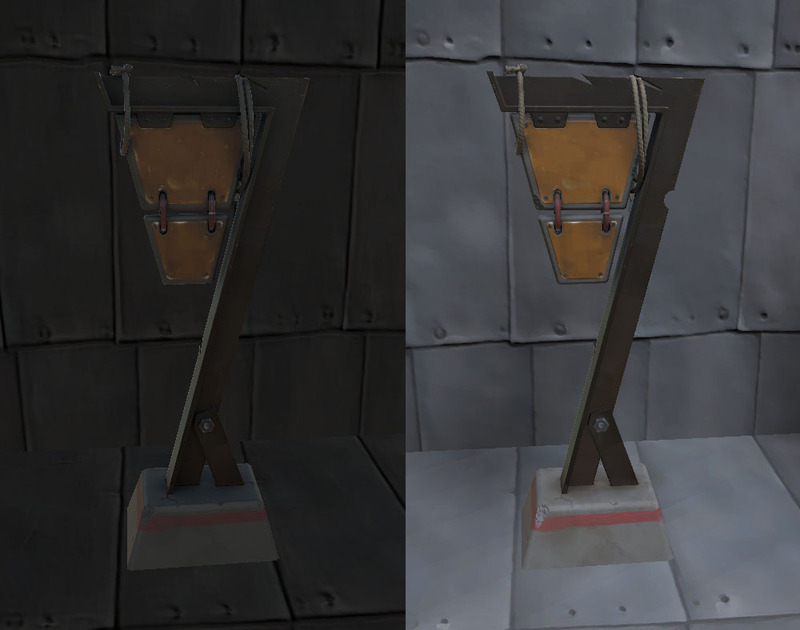 As I think I may have mentioned previously the first Clan Totem looked a bit Grey against the metal walls inside the construction system. To get around this we created another one and are going to use the original as the Territory Marker so no work wasted there. This came out pretty nice and is made up of multiple materials, so it will contrast against all the construction wall types. 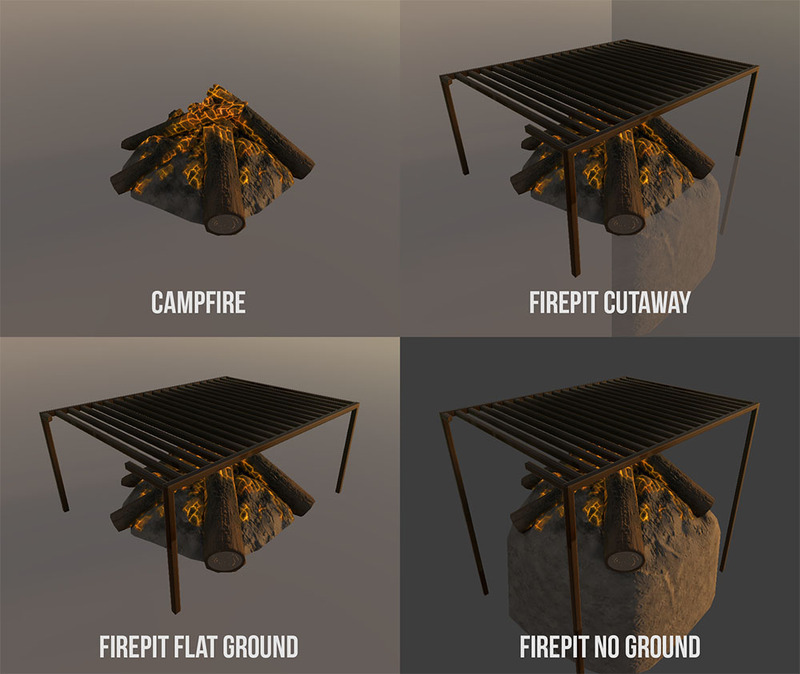 Next up I remade the campfire still based roughly on the original mesh but with much nicer textures and a more efficient mesh. This was pretty satisfying to work on. I took my time making a nice glowing charcoal material for this and it came out really well. You are in a Territory Zone. You were killed within a Territory Zone and are taking damage because you are not supposed to be inside there for the time being. You were killed within a Territory Zone and should not be there for the time being. One Last thing… I also just got this done too. 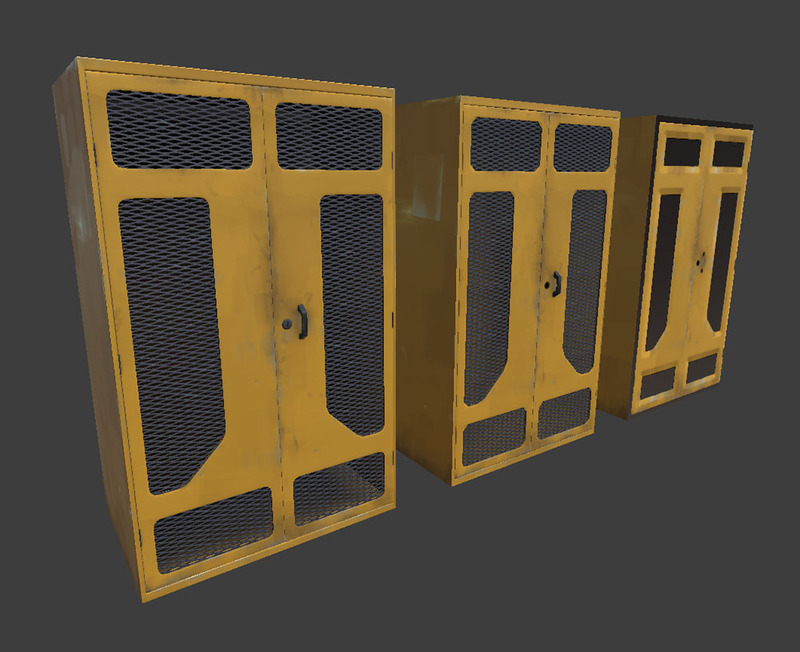 A re-texture of the storage locker. Looks way more interesting, colour should pop out more when in your base. Whattado, It has been a great week watching some of the trailer come together. Lots of problem solving working out ways to film live action segments in game engine. But starting to make things really start to pop. 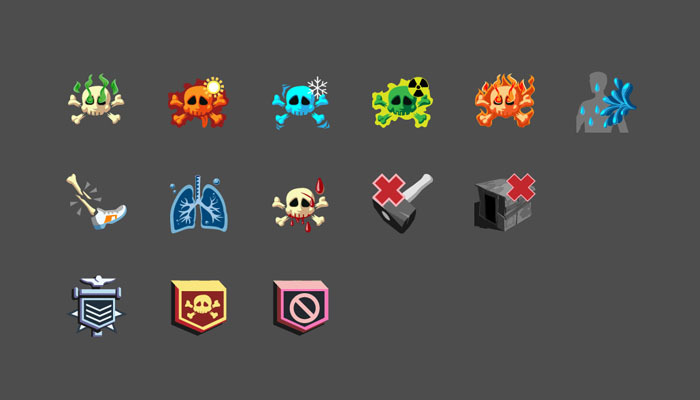 Also have been continuing work on the interface and icons for the clan system. This week I worked on building some territory stamps for the new system. The idea with these was to block the line of sight of players that had previously died in the zone and were locked out and also provide a flat area for building. The challenges with this was lining up all the build zones with the actual in game build grid. Currently these have a pretty boring design and will be updated with some actual thought put into design. I also fixed up what ever was left with the characters bar a few things which will be fixed this week. Now that we have the foundations of the clan system in place I’ve moved on to the fun stuff… Bragging rights PVP systems to rank clans! The first of our endgame PVP systems dropping next patch will be the Territory Control System. Scattered throughout the maps will be special build cells in fixed locations that have permanent totems that can only be occupied by one clan at a time. The cell will be surrounded by a significant nobuild area (currently 2 build cells in each direction). Construction is allowed by the controlling clan in the center cell but only with a limited set of prefabs (currently concrete + wood + doors) making it much harder to defend. To make things even harder for the defenders, a new type of explosives is craftable that can only be deployed inside territory control cells. The crafting cost is muuuch cheaper than normal C4, meaning holding these points is gonna be a big challenge and we expect them to change hands often. If you are killed inside a territory control cell you will gain a debuff that indicates you are currently locked out of all territory control cells. Entering any of these cells before the debuff wears off will cause you to take lots of damage. This timeout is currently set to 5 mins, we will tune this as we go. Ultimately if you kill someone in a territory control skirmish, they stay dead for a bit regardless of their bed proxmity / cooldown. This should put everyone on a more even playing field. In addition to this no beds will be allowed inside territory control cells. If you are killed as a defender safely behind your walls, you are locked out of the cell. No picking up your loot, no running back up to get back in the fight… making online raiding a LOT easier for these bases. Initially the territory control system will purely be for bragging rights. We plan something around 2 per biome that will show clearly on the map which clan holds each one. Territory totems will also accumulate reputation points over time that need to be manually claimed in person periodically. Unclaimed points will show on the map putting a higher bounty on sacking specific territories for enemies. For the first iteration reputation points will be used to rank clans in the clans window. Over the coming patches we plan to add in clan unlocks that can be purchased with reputation like special clan tags, gear shaders, and vehicle skins so it is obvious when out in the world that your clan is powerful in this server. 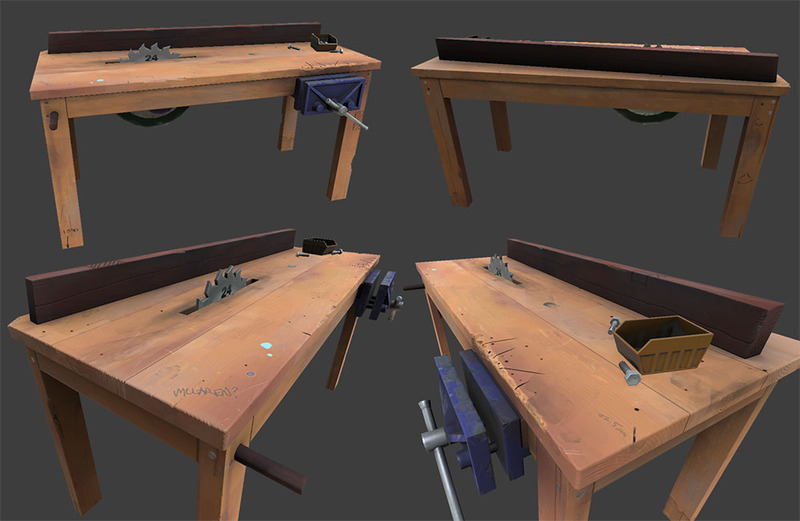 I got the workbench update done this week, I think it came out really nice. The old one had all it’s PBR texture values wrecked between V1 and V2 and while it looked okay, some parts were like mirror chrome. This is pretty much the same mesh, but upgraded and the poly count was optimised. Had fun working on this and it should be in game very soon. We decided to change the current Clan Totem mesh because of some colour issues we noticed. When the Clan Totem is inside a base with metal walls, the clan totem gets pretty much lost in the same kind of material and colour. 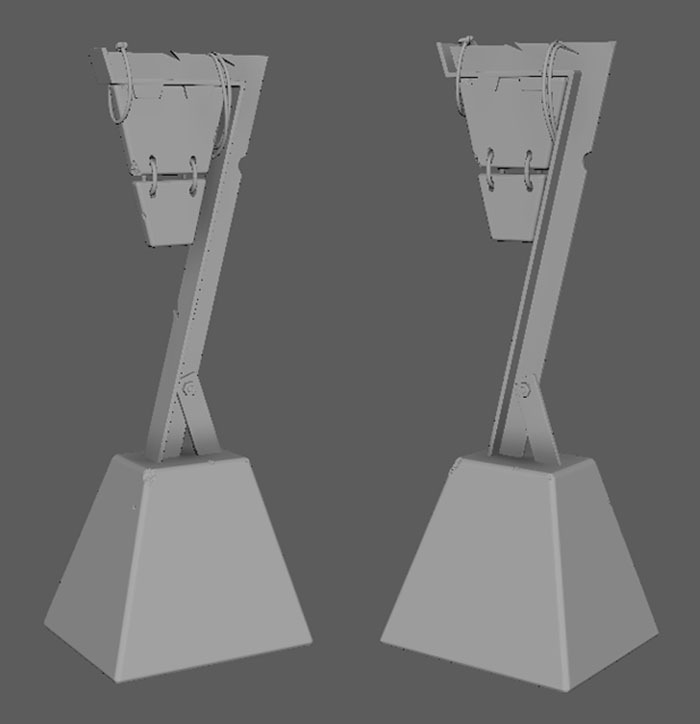 This asset will now be used as the Territory Marker, when that comes in very soon. I’ve taken the design from the concepts I did with the odd 7 shaped marker and we will use that as the Clan Totem when it’s complete. This has 3-4 materials, so should contrast nicely with the inside of a base no matter what walls are up around it. Below is the high poly version. I’m getting through this quickly and I’m at the UV mapping stage right now. Should be done with the texturing by Tuesday I hope. Worked on getting all the character updates in game this week, there were a lot of challenges with weird skinning processes luckily it was stuff that had already been worked out during the female characters. Just need to fix up some texture issues here and there but nothing major, gotta add in all the gear that had to get fixed up to stop any clipping on the new models. Might be adding just a bunch of new heads for some variety while we are already running through this workflow. We shall see. 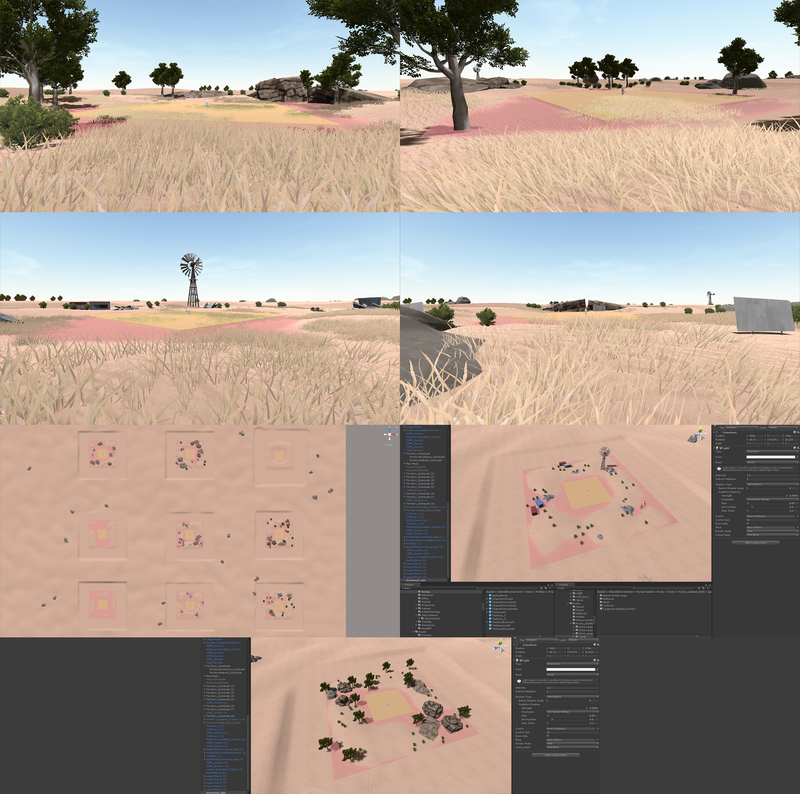 Since last devblog I’ve been finishing up the clans implementation for the 0.6.3.0 patch and then continuing to polish it up further adding better tracking of your clan applications and doing a pass over the new interaction tab UI improving the layout consistency. With the clan system fundamentals in place we can now start moving onto the exciting stuff we’re planning to build on top of it! I also fixed a long standing bug in our mesh attachment generation system where skinned mesh attachments would fail to generate correctly if any bones that indirectly affected mesh deformation differed from the skeleton rest pose. Getting this bug fixed removes the major blocker to getting the updated faces Splatt has been working on into the game. I’m taking the next couple of weeks off to go on holidays so you won’t hear from me for a little while. Once I get back though it’s full steam ahead with Hurtworld as we’ll be making a big push to get stuff done by the end of the year, hopefully we’ll announce some more specifics about this soon! After a busy week of getting stuck into the UI, updating icons and refining the clan windows, it is time to get back on the V2 trailer. We have a loose storyboard on the go and have been throwing around ideas to capture the vibe of V2 and everything the lads have been working on. Lots of capturing footage and setting the tone with placeholder music ahead.